C1492. 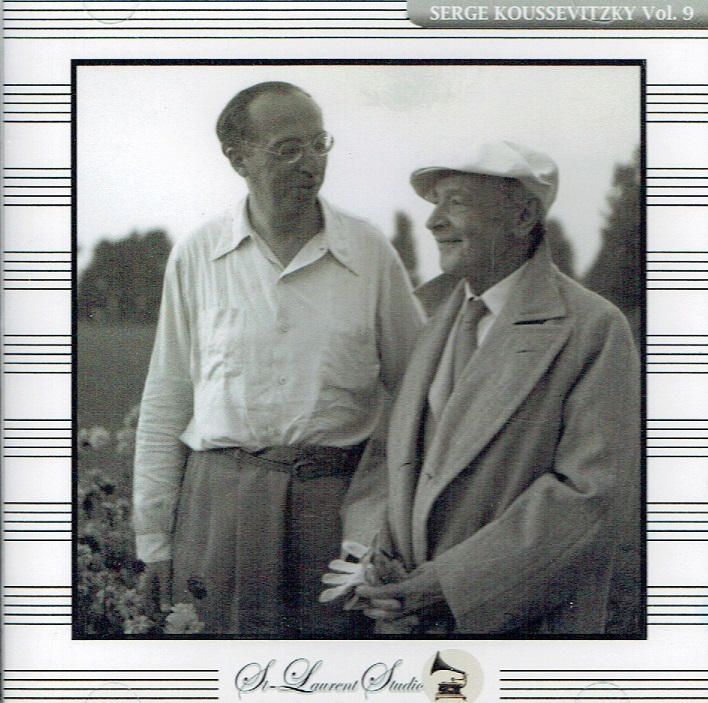 SERGE KOUSSEVITZKY Cond. Boston S.O. : Symphony in d (Franck), Live Performance, 16 Feb., 1946. 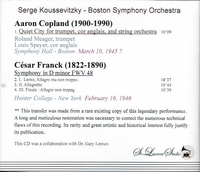 Hunter College, New York; w.Georges Mager (Trumpet) & Louis Speyer (English Horn): Quiet City (Copland), Live Performance, 10 March, 1945, Symphony Hall, Boston. (Canada) St Laurent Studio YSL 78-410. Transfers by Yves St Laurent. “During the 1910s, Mager played with the Paris Opera Orchestra, the Concerts Lamoureux, and the l'Orchestre de la Société des Concerts du Conservatoire. After World War I, Georges Mager was part of a U.S. good-will tour of the Garde Républicaine Band. With the Band, Mager was flügelhorn soloist (a sort of wide bore trumpet). 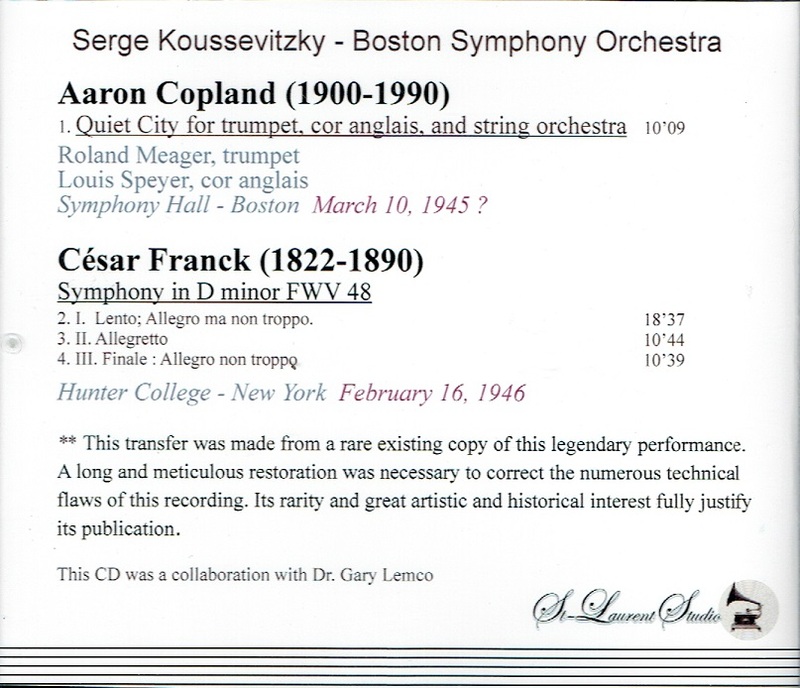 Three musicians from the Garde Républicaine Band were hired into the Boston Symphony by Henri Rabaud for the 1918-1919 season: Louis Speyer English horn, Georges Laurent flute, and Georges Mager trumpet. However, since there was not a trumpet chair open, for this first season, Mager was hired as a violist (!). Interestingly, Mager shared a viola stand with with Arthur Fiedler in this 1918-1919 season. The next season, 1919-1920 under Pierre Monteux, Georges Mager was then moved to the third trumpet chair, sitting behind Gustav Heim and Joseph F. Mann. After the disastrous 1920 musician's strike, Gustav Heim left for the Detroit Symphony. Heim was, along with Concertmaster Freddy Fradkin, the only Principal musician to leave following the strike. The next season in 1920-1921, Georges Mager became Principal trumpet until the conclusion of the 1949-1950 season. This service was for a total of 50 seasons as Principal trumpet, and 52 seasons with the Orchestra. Georges Mager was an important teacher, including at the New England Conservatory. Among his trumpet students were Adolph Herseth (later Principal trumpet of the Chicago Symphony), Roger Voisin (Mager's successor), and Bernard Adelstein (later Principal trumpet of the Cleveland Orchestra). Mager was one of the early advocates of the C trumpet for the orchestra, with its slightly more brilliant tone. Speyer became an extra oboist for the Orchestre Colonne, which accompanied the Ballets Russes in France, and in that way participated in several premieres of works by Ravel and Stravinsky. In early 1913 he joined the newly formed Orchestre du Théâtre des Champs-Élysées, conducted by Pierre Monteux, which gave its first performance on 2 April 1913. Two months later, he played in this orchestra in one of the most famous concerts of all time: the program included LES SYLPHIDES, LE SPECTRE DE LA ROSE AND THE POLOVTSIAN DANCES, but is remembered for the raucous premiere of Stravinsky's RITE OF SPRING.